We worked for the Israel Public Diplomacy Forum, which is an independent, non-governmental, academic centre brought to life in order to spread knowledge about Israel and the Middle East. 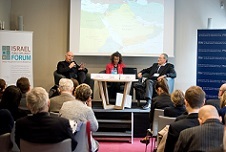 In October, Poland hosted a series of debates organised by the client. Our agency was responsible for conducting media relations and providing PR support before, during and after organised events.